Product prices and availability are accurate as of 2019-04-13 17:22:08 EDT and are subject to change. Any price and availability information displayed on http://www.amazon.com/ at the time of purchase will apply to the purchase of this product.
" 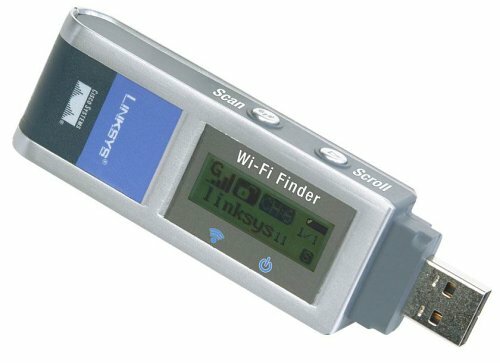 Linksys Wireless-G USB Network Adapter with Wi-Fi Finder - Add Wireless-G to your notebook or desktop computers and detect wireless signals without powering on your PC The Wireless-G USB Adapter with Wi-Fi Finder is a handy, pocket-sized device that combines an easy-to-use wireless network scanner with a USB-connected Wireless-G network adapter. Now you can scan for available wireless connectivity before turning on your computer. If the scanner does find a network, just plug it into your PC and get connected. The Wi-Fi Finder detects Wireless-G and Wireless-B networks with a simple push of a button. It displays all pertinent information such as the wireless network's name (SSID), signal strength, the channel used, and whether wireless security is enabled or not. The information is displayed on an easy-to-read LCD display and can be set up to look for only open networks, all networks, or a specific named network. Discovered networks are listed in order of signal strength. The advanced wireless search technology filters out 2.4GHz interference given off by microwave ovens, cordless phones, and Bluetooth devices to provide readouts only on working Wireless-G or -B networks. With the Wi-Fi Finder built into the unit, you no longer need to power on your PC to determine if there's a wireless network connection available. Public wireless hotspots are springing up all over in coffee shops, airport lounges, hotels and convention centers. The Wireless-G USB Adapter with Wi-Fi Finder from Linksys makes it easy to find, and connect to, those hotspots. Also works with :- WRT54G - Share your high-speed Internet connection with Wireless-B, Wireless-G, and wired Ethernet devices. WAP54G - Connects Wireless-G or Wireless-B devices to your existing wired network WPC54G - Connects your notebook computer to Wireless-G networks.